hmmm Christie have you gone bonkers? aren’t I keen to prove you wrong lol but seriously you can’t dis this until you’ve tried it! Bananas are still playing up with yo girls poor tummy and I know i’m not alone on this one, so I have been experimenting with different ingredients for my smoothies and desserts and this one is a WINNER WINNER AVO DINNER! not only is this mousse recipe LIT AF.. I have also [finally] been able to master a chia pudding recipe!”YAY” Because in my personal opinion most chia puddings taste like a soggy ball of shiz with an unusual bally texture to it. But that was then.. and this is now! Good bye soggy ball of shiz and Hello new and improved vanilla chia pudding! 1 serve of @nutraorganics vanilla protein powder use my code ‘CEE20’ for 20% off otherwise any plant protein will do. Prepare the chia pudding by mixing all the ingredients together in a jar, and leaving to set. Next I recommend preparing the granola by pulsing the medjool dates, shredded coconut, buckinis or oats and maple syrup together in a blender, then transferring the mix into a bowl or jar. 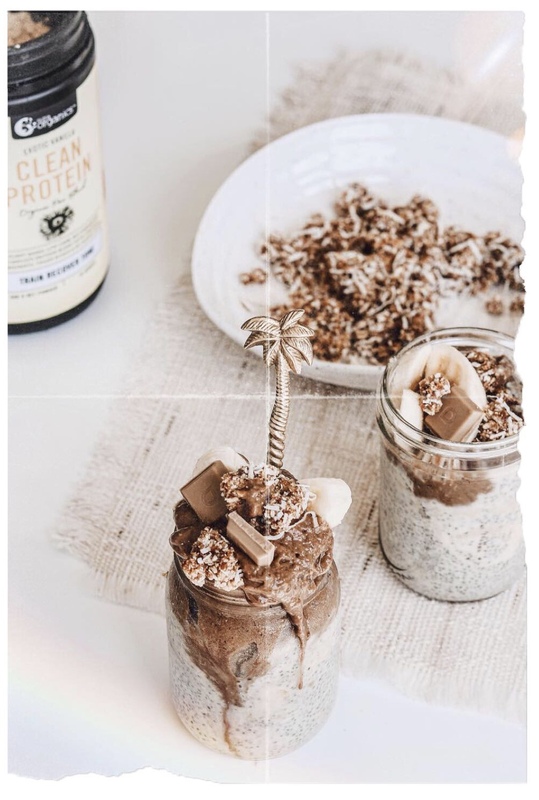 For the avocado mousse, blend all the ingredients together until its a nice thick and creamy constancy, then pour ontop of the already set chia pudding, adding the chocolate and prepared granola and any fruit of choice. WANT TO COOK THIS RECIPE WITH ME?